The Prague Metro (Misa says) is an underground public transportation network in Prague. It is fairly cheap, efficient, safe and reliable. It is also the fastest means of transport around the city and serves about one and a half million passengers a day. The Prague Metro has three lines, each represented by its own color on the maps and signs: green Line A, yellow Line B, and red Line C. There are 57 stations in total, three of which are transfer stations. The stations are connected by nearly 60 km of mostly underground railways. 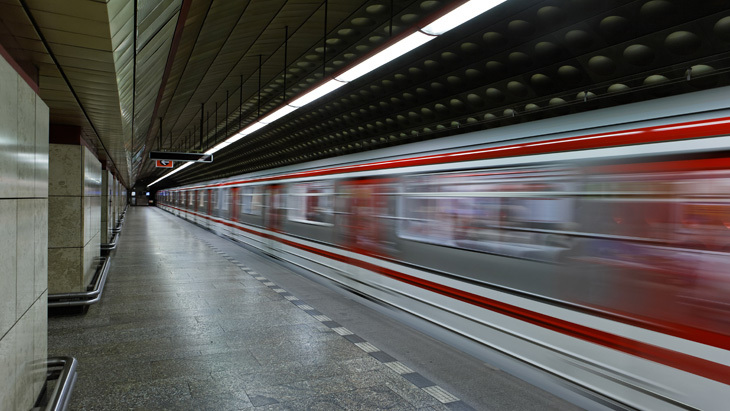 The Prague Metro operates between 4-5am until midnight, with about 2-3 minute intervals between trains during rush hours, and every 4-9 minutes after 7pm. Many Prague Metro stations are quite large, with several entrances set relatively far apart. Therefore, to get to your destination make sure to not only get off the right station, but also choose the right way out to the surface. In general the stations are well signposted even for those unfamiliar with the Czech language.